Each month I team up with my blogging friends and share a craft project with you made from supplies I have been hoarding collecting. We call it the Craft Room De-Stash Challenge. 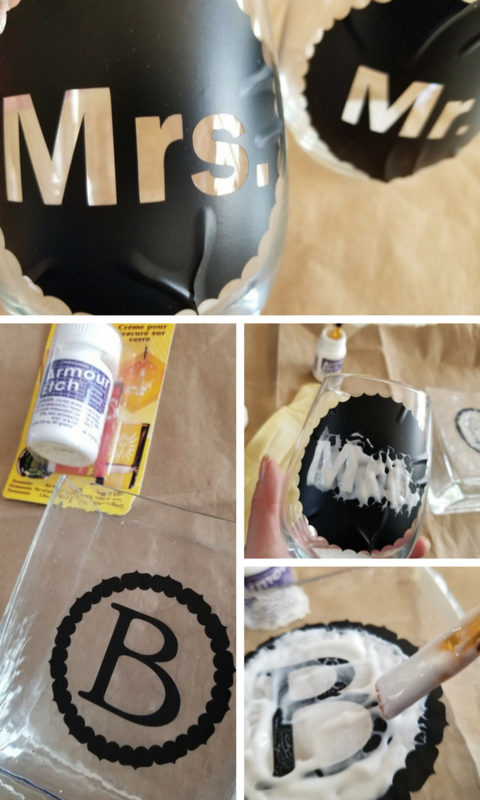 Today I am showing you how to DIY etched glass. 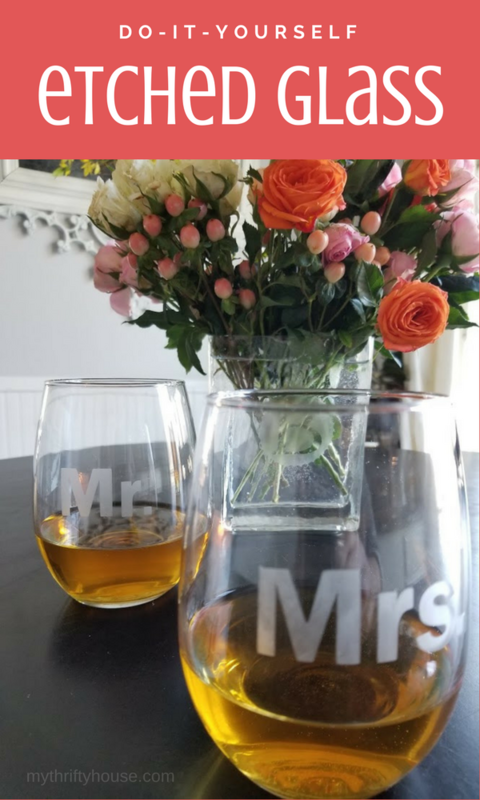 I love the personalized look of etched glass and the endless possibilities for creating home decor pieces or unique gifts. 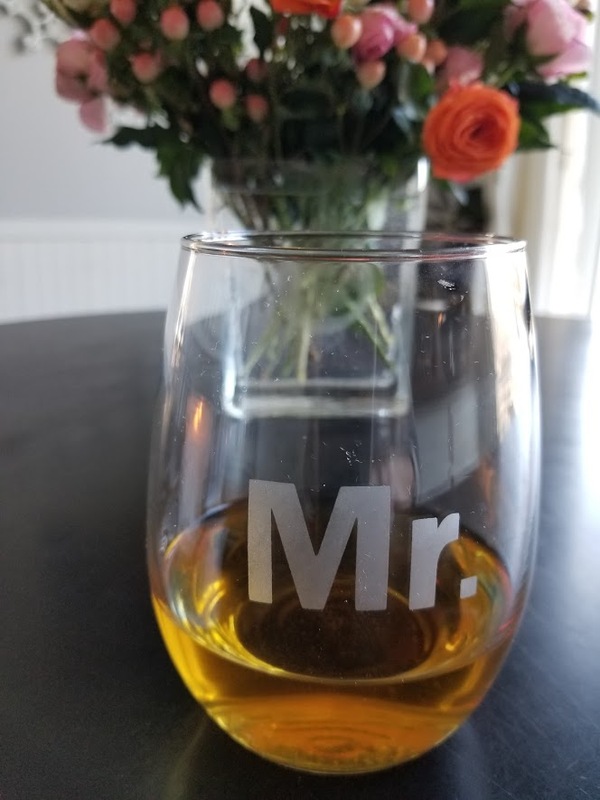 How about a personalized wedding gift? 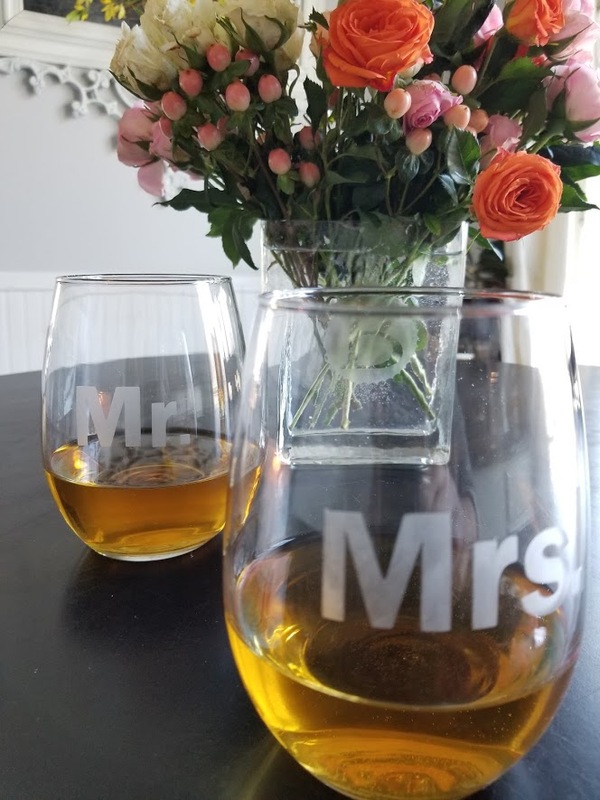 My younger brother recently got married and I thought it would be fun to etch some stemless wine glasses from the Dollar Store and make a unique wedding gift. I wanted to keep it simple, personalized and cherished because it was handmade by me. Personally, I always appreciate receiving handmade gifts because there is so much thought and time put into making the gift. But I really like being the gift giver and seeing my gifts displayed and used in someone’s home. 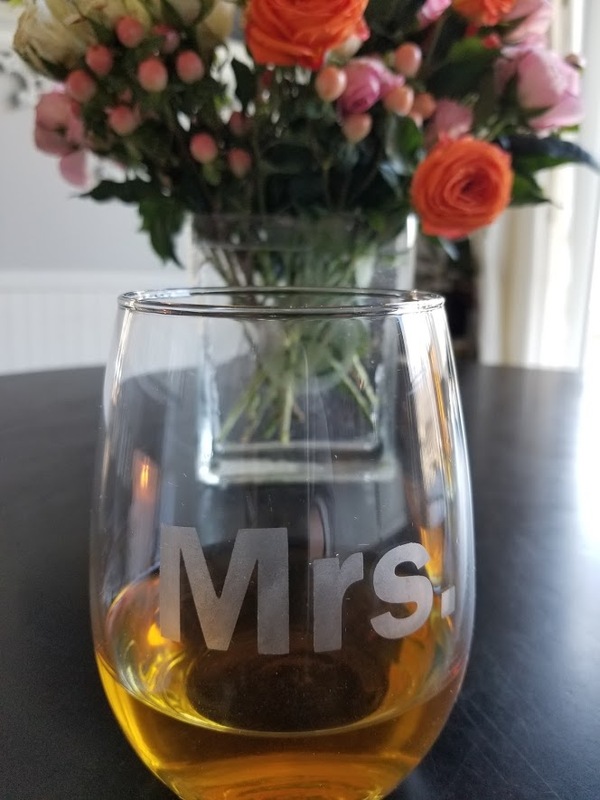 While scrolling through Pinterest I was inspired to make more than just some etched wine glasses and started thinking of things I would use in my own home. Maybe if I keep this etched glass flower vase out on the table my family will be reminded to keep it filled with fresh flowers. Choose your glass object and clean it well before applying your stencil. I used dollar store glasses and recycled other glass items I already had in my house. You can purchase stencils but I made mine using the Cameo Silhouette. I applied the etching cream with a paint brush and gently swirled it into the exposed area that I wanted frosted. I let the cream sit for 3 minutes and then I went over it again with my paint brush to smooth out any air bubbles and to remove any hardened cream. After a total of 10 minutes I rinsed with warm water, removed my stencil and wiped it down with a damp paper towel to remove any excess cream. NOTE: if etching cream sits on the glass (even a tiny drop) it will etch that spot so be careful applying and removing the cream. 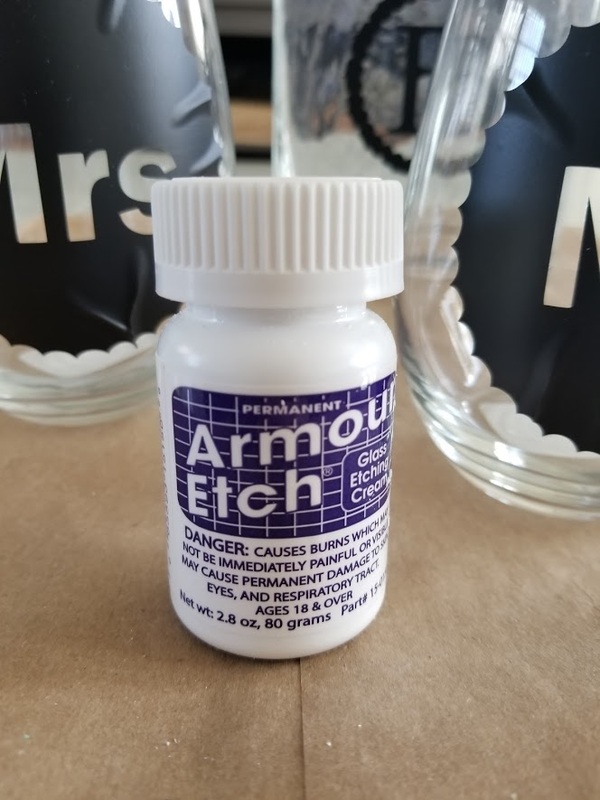 Overall, I was quite impressed at the ease of using this etching glass cream for my projects and I will definitely be using it for other ideas I have swirling around in my head. 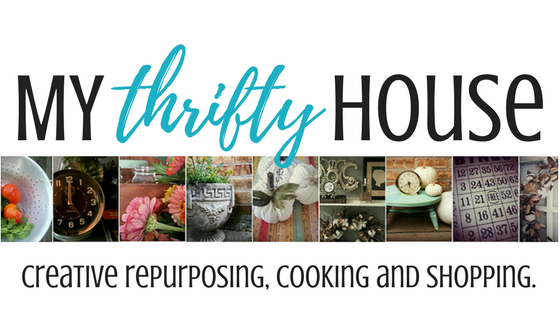 Don’t forget to keep scrolling to see what my friends did with their craft room stash. I did this once and totally need to do it again. Great job. And here I always thought this is done with some sort of power tool, and that it would need a lot of patience as to not break the glass. I am super thankful that you decided to share this simple, yet wonderful DIY with us today. Beautiful project. I’m sure your brother will cherish them. And you will enjoy filling that vase often. Thanks for sharing. Denise, I’m impressed by the professional look to the etching you’ve done! And all by applying cream and a stencil. It’s totally amazing. I can see this in my future too. This brings back so many wonderful memories of a glass etching kit that my Aunty gave me for Christmas! Loved it to bits!! Things sure have become a little easier to do with the etching cream!! Time to try this again! I need to make some of these for my 2 children – both are getting married in the fall! 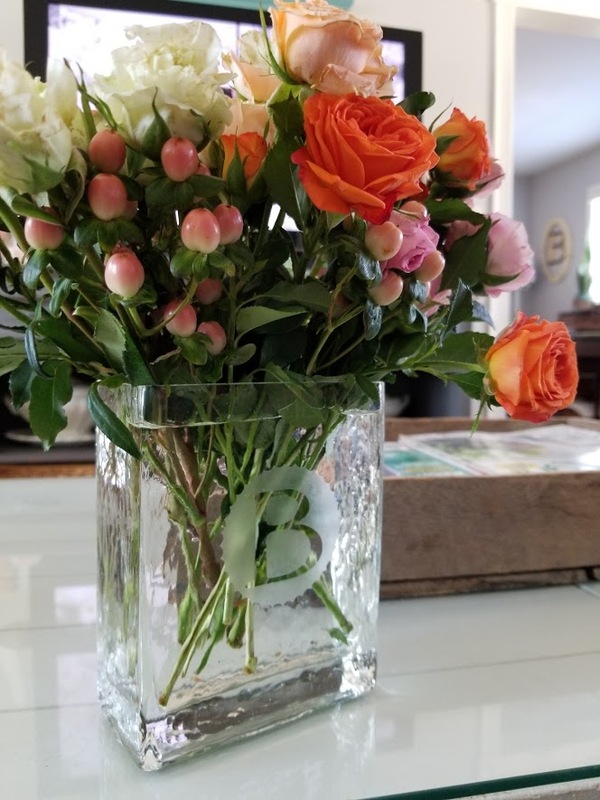 Your etched glass projects turned out lovely! I’m sure your brother and his new wife will treasure the wine glasses you made for them. I also like the idea of putting your initial on the platter so that it will get returned when taken to potlucks. Thanks! 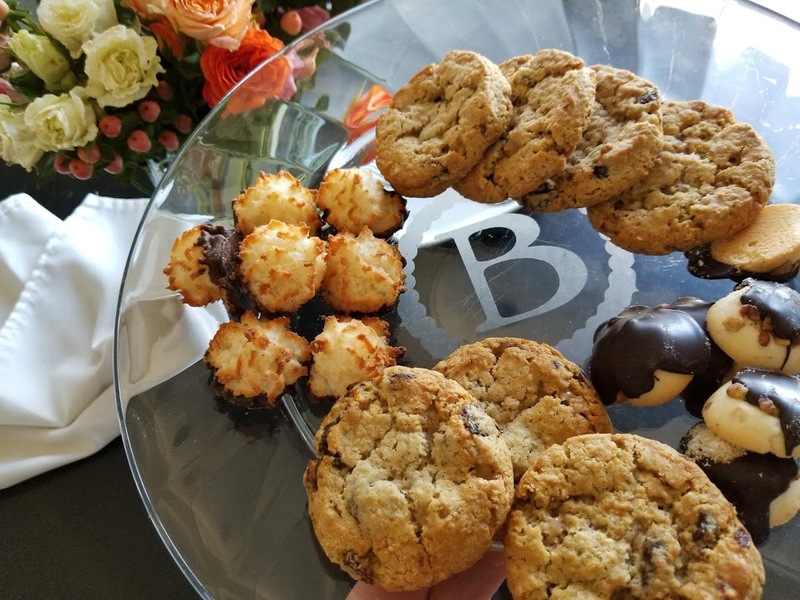 Yes, they do love the glasses and I do love my platter. Isn’t it a lot of fun? Love the idea of doing it with friends. These look fabulous. It is something I have never tried but I think I should. I agree about receiving a handcrafted gift. And making a gift also. This is definitely an easy project you should try. I’ve always wanted to try glass etching. Your glasses look so good and are a beautiful gift. Pinned. Yes, the extra vinyl was perfect for this project. So many customization options. This was so very easy and I loved the results. I’ve tried this several times, but couldn’t get desired results. You did an awesome job on glass. I’ll try it again!